I make New Year’s resolutions and this year, among other things, I’ve resolved to try and treat arguments solely on their merit — I will not worry about the identity or background or past statements or biases or level of information possessed by the person or persons making the argument, I will simply look at the argument itself. 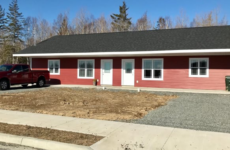 I’ve decided to take my resolution for a test run by looking at some of the responses I’ve seen on social media to the decision of the Nova Scotia Utility and Review Board (NSUARB) in the case of the Big Pond RV Park. To recap: CBRM Council voted to amend its zoning by-laws to allow Calgary-based developer Chris Skidmore to establish an RV Park on the Bras d’Or Lakes in Big Pond. A group of residents appealed the decision and the UARB ruled in their favor. I’ve written in some detail about the decision here, a former CBRM director of planning wrote about the CBRM’s options here, and Big Pond resident Lorna MacNeil provided an enviably concise summation of the ruling here. The Cape Breton Post and the CBC have also covered the issue but without delving very deeply into the UARB’s reasons for overturning a council decision — something the board very rarely does. Personally, I don’t think Skidmore’s proposal was very well thought out or suited to the location he proposed, but I am open to reason, so I decided to see what kind of arguments the pro-camp was making on social media and evaluate them according to my New Year’s rules. 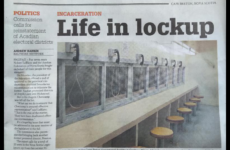 Social media, I should say, scares the crap out of me, but I forced myself to read a bunch of posts on the RV park decision — including some from one of Facebook’s Cape Breton rant rooms (which I think is the virtual equivalent of chatting up the people hanging around the base of the guillotine in Paris in 1793). I also drew some comments from a pro-RV park online petition that garnered 492 (unverified) signatures. I have no idea how much (or little) these various social media commentators know about the case, but in keeping with my resolution, I’m not going to worry about that, I’m just going to consider some of their arguments. I think it is fair to say that there is always a an element of “not in my back yard” in zoning disputes. Sometimes — like when a developer proposes to situate a landfill or a nuclear waste disposal site or a car alarm-testing facility or a slaughterhouse in your backyard — it makes sense to protest. But sometimes, like when the development is a group home for people with mental illnesses, worrying about the effect it might have on your property value just makes you look bad. 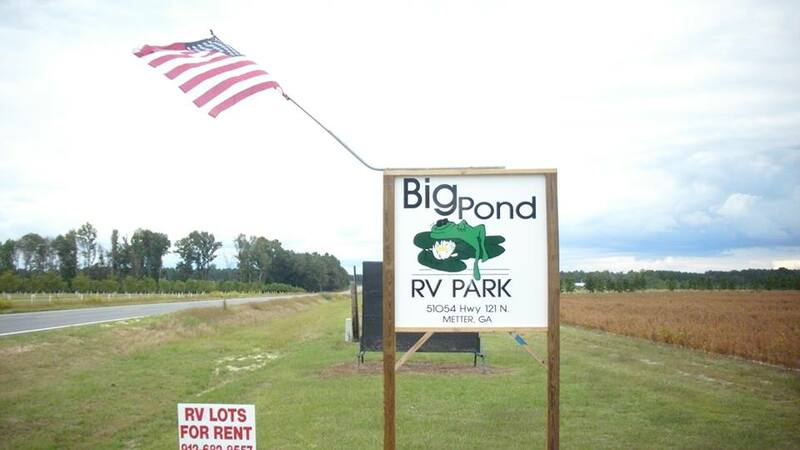 In the case of the Big Pond RV park, as others have attempted to point out, the UARB decision is not based on whether residents do or do not want an RV park in their back yards (although obviously, the ones who appealed the CBRM decision don’t and it would be disingenuous to pretend otherwise). It’s based on whether the CBRM met the conditions — set out in its own Municipal Planning Strategy (MPS) — under which it can change the zoning by-law to allow an RV park in their back yards. The UARB said the municipality had not. I would also point out that supporters of Skidmore’s project were given ample opportunity to voice that support — they could have spoken out during the public hearings (only one did); they could have submitted letters of support to the CBRM (few did); they could have submitted letters of support to the UARB during the appeal (only three did). For that matter, Skidmore himself could have done more to help his own cause — he could have called witnesses during the appeal or spoken himself. He did neither. The outrage I’ve seen expressed on Facebook seems misplaced — if you’re going to take the time to write about it, why not write the UARB? I am assuming “Halifax” here means the provincial government and not the Halifax Regional Municipality. So the question is: why does the provincial government have a say in what can or cannot be in the CBRM? In this case, though, although it seems like the provincial government, as represented by the UARB, is having the final say in the Big Pond RV dispute it’s actually more nuanced. The UARB decision, as noted previously, is based on the CBRM’s own rules — as expressed in the above-mentioned MPS — and the CBRM writes its own rules, which is why former CBRM director of planning Doug Foster has written, in these pages, that if the CBRM wants to allow a development like Skidmore’s in Big Pond, it needs to rewrite those rules. But there’s a deeper question here about the power of municipalities, one that kept raising its head during the RV park debate, every time anyone said, “That’s a provincial responsibility” (generally in relation to any responsibility toward the environment). I’ve done a little reading on it and will write about it in more detail another day. I read many online comments like this from posters who seem to believe the RV park’s facilities will be open to the general public. Many people seem to think it will be like having a water park or an amusement park on Route 4, but I don’t think that’s how RV parks generally work — the facilities will be for the paying customers and paying customers would surely kick up a stink if their kids couldn’t get on the zip line or use the basketball court because it was over-run by daytripping locals. This is interesting because it completely contradicts the many other posts I’ve seen arguing the park will help the local economy in Big Pond (I’ve seen people suggesting you could see two convenience stores and a gas station once again in the community). If Skidmore’s park were to attract actual tourists, then yes, there could be some additional spending in Sydney. Although it could as easily go to St. Peters. Or Port Hawkesbury. Remember we are towing or driving our cottages. They have electric and gas powered refrigerators in them and most people stock them and their cabinets prior to leaving home. There are often a few things you may need on your trip but you are so anxious to get there and relax so you normally have everything you need before leaving home. And you always gas up before you arrive not knowing where you will be able to on return. On the other hand, if Skidmore’s park is intended for locals (and the RVer above seems to think it is, based on the number of sites per acre), they would be shopping and eating local anyway. The idea that an RV park will prove to be a great generator of jobs honestly puzzles me. I have never heard the Ben Eoin Campground, which has 207 RV sites (phase one of Skidmore’s project would have 211), described as a great job creator. Unless it is simply a place for Cape Bretoners to spend their summers, in which case, it will not be good for tourism. I will admit, I rolled my eyes when I read this, but then I made myself stick to my resolution and respond rationally. “Halifax” as in “the provincial government” isn’t blocking the Big Pond RV park (see comment No. 2). The province did cut its support for Sydney steel, it’s true, although only after having spent millions to keep it afloat for decades. But debating the pros and cons of this is beyond the scope of this article and also, I would suggest, irrelevant to the RV park discussion. The coal mines were dependent on the federal government for survival (Adrian White has written a very lucid account of their demise for the Post) but again, the issue of whether or how this support should have been continued is beyond the scope of this article and equally irrelevant to the RV park discussion. That said, I am of the opinion that supporting the Halifax metro area at the expense of the province’s other municipalities has been a longstanding policy in this province, so the poster and I do have some common ground. Historically, we’ve not only been open to business, we’ve let business walk all over us — we gave the first owners of the steel plant a huge tract of land for a song; we let mining companies basically own entire towns; we let profit prevail over worker safety and environmental concerns for centuries. And in the past 50 years, we have been, like virtually every municipality in the Western World, slaves to the neoliberal conviction that the way to help people is to help businesses. As for allowing the Big Box store by the dump, this is another comment that initially made me roll my eyes but then got me trying to puzzle out the poster’s meaning. Do they think the CBRM should have stopped the Big Box store from opening next to the dump or do they think the CBRM forced the Big Box store to open next to the dump? I also don’t think Skidmore’s proposal has been stymied for lack of support, either from elected officials (seven of whom — including the mayor — voted in favor of modifying the zoning by-law to allow the project to proceed, remember) or bureaucrats (the CBRM’s planners have done nothing but aid and abet him). I can only think this poster takes very selective trips around the island, or else they stuff their ears full of cotton wool before driving though certain parts — like Inverness, for example, where council has adopted a fracking ban designed precisely to keep a certain type of business out. Or Kelly’s Mountain, where First Nations have protested plans to mine land they consider sacred. Again, I feel compelled to note that this municipality has put hundreds of thousands of dollars into economic development schemes intended precisely to assist people who want to create and start businesses. I keep seeing these sweeping generalizations about “policies and legislation” that are killing industry on this island but I never see any evidence to back them up. From where I sit, governments of all levels have been bending over backward to assist industry (the most recent example being Monday’s announcement that the province would give the new owner of the Sydney Call Centre a $2.4 million payroll rebate). Moreover, “supporting” the tourism industry could be as much about protecting the environment tourists come to see as about encouraging an RV park. And the idea that we should applaud a council trying to “circumvent’ its own policy is ridiculous. I took most of the sweary words out of the post above to facilitate my treating it seriously. Taken at face value, what the poster seems to be suggesting is that the people who don’t want an RV park in Big Pond are wealthy hypocrites who put the steel plant in the middle of Sydney (in 1900), then built a Walmart, then situated the city dump right next to it. Also, I’m not sure what the poster’s definition of “upper class” is, but if it has to do with annual income, I’d suspect it includes Skidmore. Try as I might to make logical sense of this argument, I really can’t. I know the people opposed to the RV park aren’t responsible for locating the Sydney steel plant in the center of town, nor were they involved in locating the Walmart or the dump. As I said, I’ve tried my best to take this argument seriously, but I cannot. There are limits to my ability to stick to my New Year’s resolution and I’ve reached them. I’m going to go back to eye-rolling. Hey, while we’ve got you here, can we just say thanks for reading the Spectator? We’re always glad to see you. 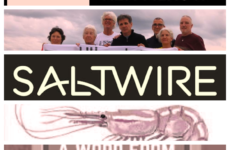 That said, if you wanted to make us dance a (virtual) jig of joy, please consider subscribing. 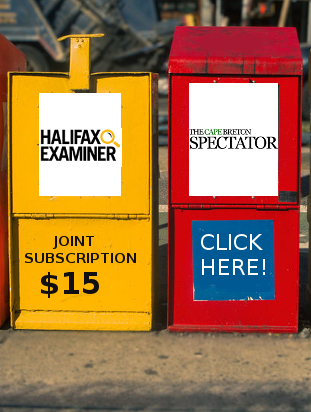 You can find out more about what we’re all about here, before cruising on over to the Subscriptions Page, where you can choose from a fine selection of possibilities — including a joint subscription with the Halifax Examiner. And right now, if you take out a regular, annual subscription to the Spectator ($100) or a joint annual Spectator/Examiner subscription ($160), you’ll get a free gift — yes, you read that correctly, the Spectator’s got swag! Prefer to monitor the situation awhile longer? Not quite ready to commit? 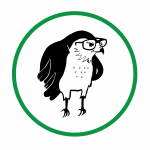 Why not sign up for our weekly newsletter to find out what’s been newly released from behind the paywall (and give us a chance to win you over)?